Downtown has always been the heart of the Billings (nicknamed the Magic City). The sturdy brick buildings along Montana Avenue still hold all the charm and nuance of centuries past. Several small hotels were built during the second decade of the 20th century. The Eagle, McCormick, Rex, Lincoln and Carlin are among those that still remain. The Carlin Hotel was built in 1910 as a first class hotel that served railroad passengers. The Northern Pacific, Great Northern, Chicago, and Burlington & Quincy railroad companies made regular stops on Montana Avenue. The hotel is part of the renaissance of Historic Montana Avenue. In 2002, it was completely renovated to bring it up to contemporary first class status. It is Billings’ first extended-stay hotel, located downtown within easy walking distance of other major hotels, government offices, restaurants, and entertainment. 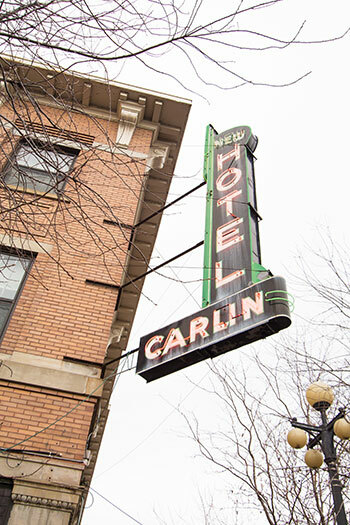 The Carlin Hotel is only a five minute taxi ride from the Billings Logan International Airport. The downtown Crowne Plaza, Northern Hotel and Best Western Clock Tower Hotels are just two blocks away.